Movement is here – and it’s a little scary. The folks at Output have some weird way of dialing directly into the zeitgeist of what we want from production these days, and delivering it in an easy form. They did that with reversed samples (REV), with vocals (EXHALE), and now they’re doing it in an atypically musical multi-effect with loads of rhythmic and side-chaining features. This isn’t just another delay or something like that. It’s an entire effects toolbox built around rhythm and modulation, in a way that’s unusually accessible. A teaser video explains what it’s about. The basic idea: add your sources, be they ambient or keys or guitar playing or even whole sets, and then make something happen. Add delays, rhythms, modulation, the lot. And here’s a walkthrough explaining exactly how they do that in the interface. We’ll do a full review soon, but here’s a rough sense of why this is a big deal. 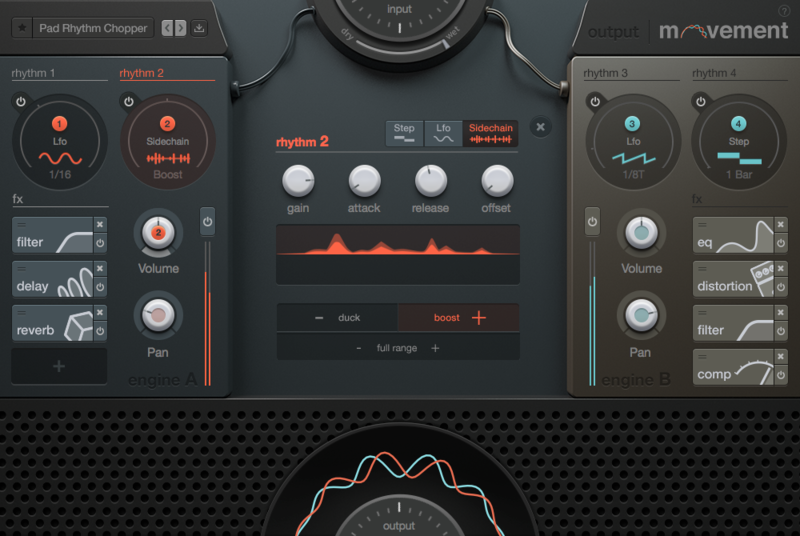 The engine gives you a lot of ways of producing rhythms. Sidechains, semi-modular modulation routing, and step sequencers give you various means to define how you want rhythms to sound, either synced or from other signals. It’s also a multi-effect processor loaded with tools. They’ve also added filters and EQ and delay and distortion and compression and reverb (whew), modeling analog equivalents. (which you can do now – thanks, modern CPU!) And my first impression is that these have a defined personality to them. So it’s not just a bunch of stuff stuck in here (which could be overwhelming), but a common set of tools that create a particular character, whether you’re calling up presets or defining your own sounds. And you can drag-and-drop modulation. This is what to me defines a more modern sound – irrespective of genre, the sense that there’s modulation everywhere. (That might be achieved even with a Eurorack or a computer, but it’s very different than sounds that come from setting knobs in a particular place and leaving them.) And it’s presented here in a really easy to approach way. Plus other performance features. There’s also an X/Y pad for “performing” these features plus what the developers call “Flux” and Randomizer to get at still more variations. Happy accidents remain one of my favorite things, so great – especially with something this deep. And, yeah, so holy s***. You could assemble these yourself with custom effects chains. But this crew from California have just pieced it all together for you. Since I don’t play things that require your fingers to touch strings (ewww) I’m asking my studio neighbor to do that in our review, and I’m going to give this a go using keys and found sounds. Let’s see what happens. Got questions for us or the developers? Let us know. Let’s have a look at that lovely interface, too. The main screen. 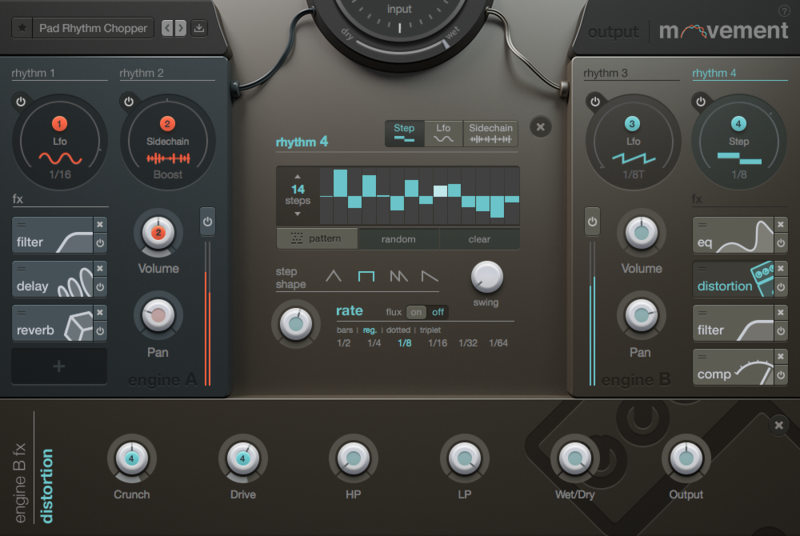 Here you see the four rhythm engines and effects chains – yes, you can layer a lot in this one tool. There’s also an X/Y puck for navigating sounds (reminiscent of tools like Apple’s Sculpture and of course the KORG KAOSS line). 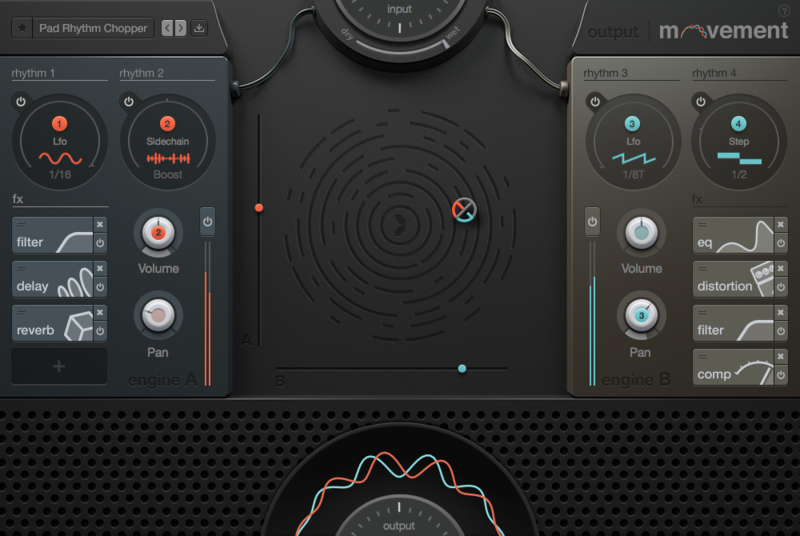 There’s a full-featured step sequencer built into Movement for rhythmic effects synced to your song. Sidechaining is also a big part of Movement — for using another signal to transform effects.